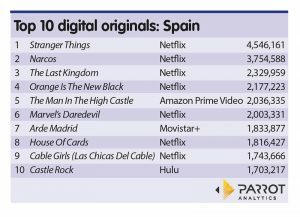 Telefónica-owned Movistar+’s digital original period comedy drama Arde Madrid secured the number seven slot on Parrot Analytics’ list of the most ‘in-demand’ digital originals in Spain for the week ending December 18. In an largely Netflix-dominated list, Arde Madrid, which is based around Hollywood star Ava Gardner’s residence in Francoist Spain during the 1960s, from the point of view of her domestic staff and is filmed in black and white, attracted an average of 1.83 million demand expressions. Arde Madrid’s inclusion represented a relatively rare appearance for a local streamer in Parrot’s regular in-demand listings, even in a market where demand for local content is high. The top 10 list was headed by Netflix’s Stranger Things, with an average of 4.55 million demand expressions, followed by Narcos – filmed in Spanish and English and now set in Mexico rather than Colombia – with 3.75 million. 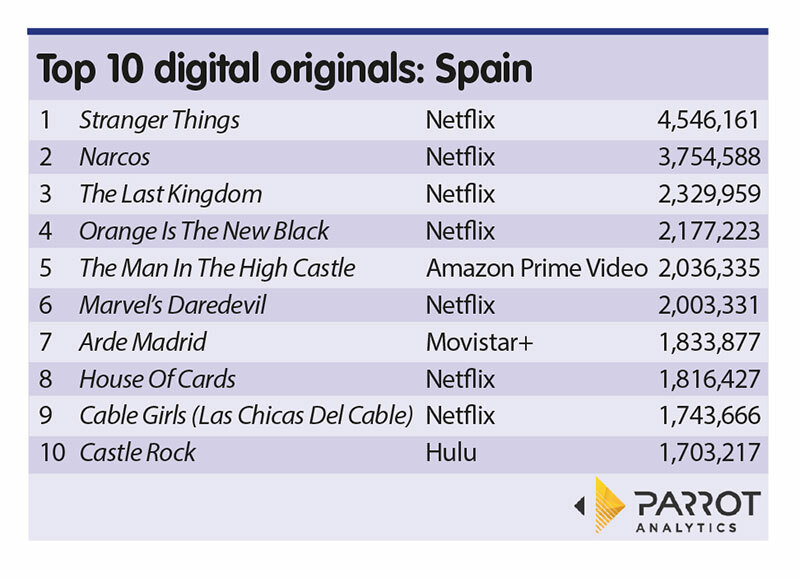 Other than Arde Madrid, other non-Netflix titles in the list included The Man in the High Castle and Castle Rock, while Netflix’s own Spanish original, another period comedy, Las Chicas del Cable, took the number nine slot with an average 1.74 million demand expressions.